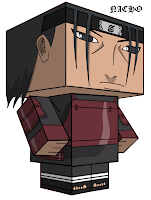 This Naruto papercraft is the Hashirama Senju, the cube craft paper toy is designed by blackignus. Hashirama Senju was a legendary ninja who became the First Hokage of Konohagakure. He hails from the Senju clan who together with the Uchiha clan established the first shinobi village: Konohagakure.